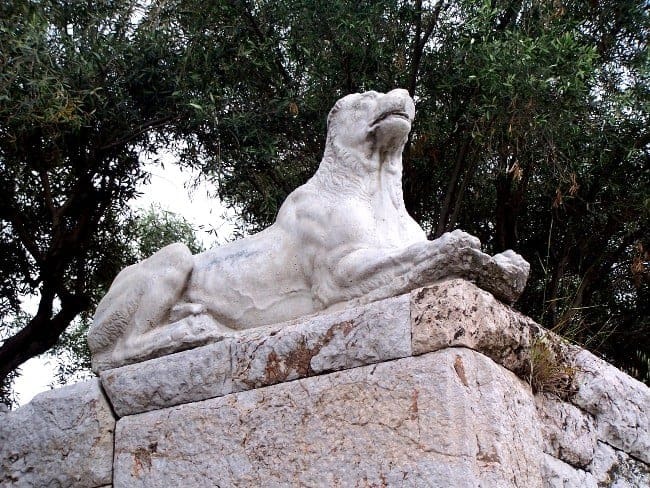 The tomb of Dexileos of Thorikos (394/393 BC). A striking 2400-year-old marble relief, showing a mounted warrior defeating an enemy, towers over an ancient roadway. It stands upon a massive terrace that contains the graves of the soldier’s family. Lining the road all around are similar funerary monuments, marking the burial places of his fellow Athenian citizens. The site is the Kerameikos, the vast cemetery of ancient Athens. Have you come across the term “tombstone tourism”? It may sound odd, but it describes a fairly common phenomenon, namely the visiting of cemeteries during the course of exploring an area or city. A somewhat morbid fringe activity? Not really: Since time immemorial, places of burial have been monumentalised, to preserve the memory of deceased ancestors and to aggrandise their status even after their passing. Graves became landmarks, meant to be seen and noticed, from the Great Pyramids of Egypt, via the Mausoleum, the enormous tomb of Mausollos of Halicarnassus (one of the Seven Wonders of the Ancient World), to the vast necropoleis (cemeteries) that lined the streets outside ancient cities. We know of early incidents of travellers looking for the tombs of famous people, such as Alexander the Great participating naked in a footrace at the tomb of Achilles at Troy or Cicero’s rediscovery of the grave of Archimedes at Syracuse. The practice continues today, probably most famously at the Père Lachaise cemetery of Paris, where thousands of visitors every year pay their respects to celebrities like Jim Morrison, Edith Piaf and Oscar Wilde. 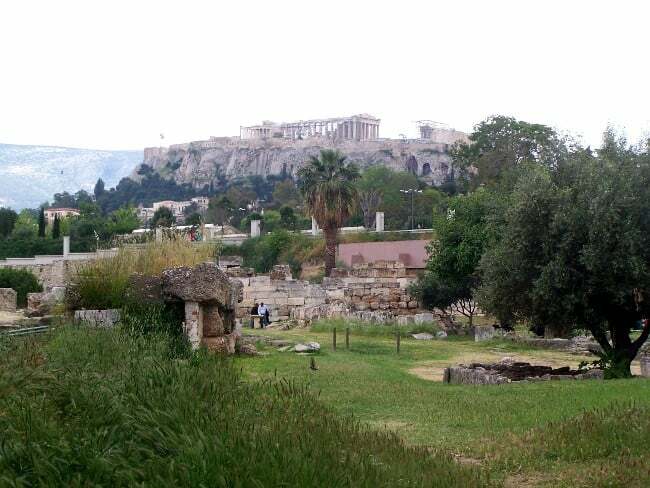 View of the Kerameikos, an urban oasis, bisected by the Wall of Themistocles and with the Acropolis in the background. Graves are also a frequent focus of archaeological tours. On our own itineraries, we visit not just the Mausoleum, but also the atmospheric ancient cemeteries in Lycia (e.g. 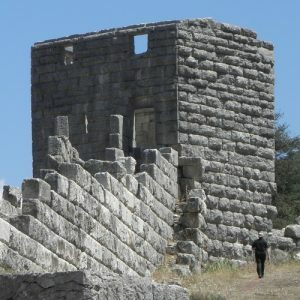 on Cruising the Lycian Shore), the Temple Tombs of Kaunos in Caria (along with the Mausoleum, on our Carian cruises), the mysterious Bronze Age necropolis of Pantalica on Sicily (on Exploring Sicily), or the tumulus containing the fallen Athenians of the battle of Marathon (while Exploring Athens). Beyond that, we also examine artefacts recovered from ancient graves at many of the museums on our tours. No wonder – ancient graves are a key source of archaeological material, and more generally, burial habits and burial sites are a central characteristic that helps us understand cultures and societies from prehistory to the present. 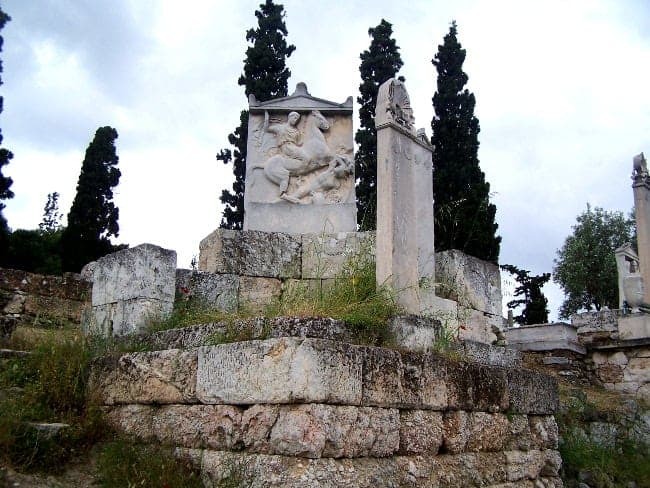 One of the most famous and most significant historic cemeteries we visit is the Kerameikos of Athens, a key point on our Exploring Athens tour. The site, at the outskirts of the ancient city but now near the centre of the modern one, is not just of immense archaeological interest but also of great beauty. Absurdly ranked in 81st place among the city’s sights on a review website I have recently poked fun at, it is a must-see, a tranquil oasis in the heart of the metropolis, surprisingly removed from the hustle and bustle all around, traversed by a stream and home to a thriving population of tortoises! Detail of multiple phases of the Themistoclean Wall, first erected in 478 BC. Explored for over a century, the Kerameikos falls in two parts, one inside the boundaries of Classical Athens, the other one outside. What separates them is the Themistoclean Wall, itself a major historical monument. As the historian Diodorus reports, after the temporary abandonment of Athens during the second Persian War of 480/479 BC, the Greek allies, led by Sparta, were debating the option of banning Athens from rebuilding its fortifications, so as to prevent a future invader from gaining a stronghold. Under the leadership of Themistocles, Athens sent emissaries instructed to stall negotiations, while a new and expanded set of city walls was created hurriedly and on the sly. The foundations of that wall, repeatedly rebuilt and restored for many centuries, are there to be seen – and excavations have revealed the rushed construction of their initial phase, incorporating many grave monuments that stood in the area previously. 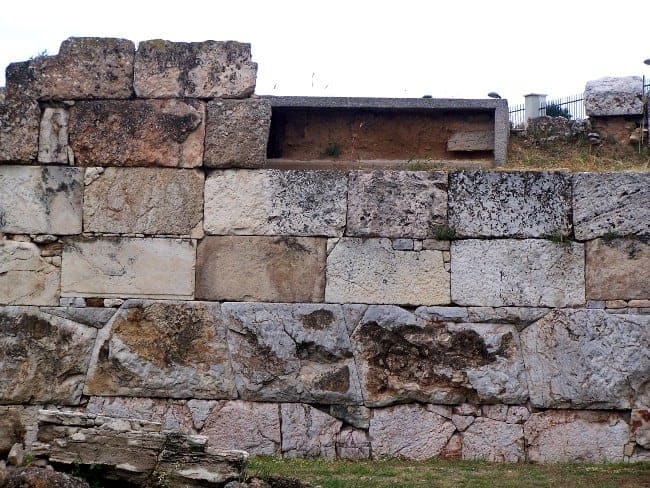 A key example of Classical Greek defensive architecture, the wall is pierced within the Kerameikos archaeological area by its two most famous gates, the Sacred Gate and the Dipylon (“double door”). It was between them that the Roman dictator Sulla’s army breached the Athenian defences in 86 BC. 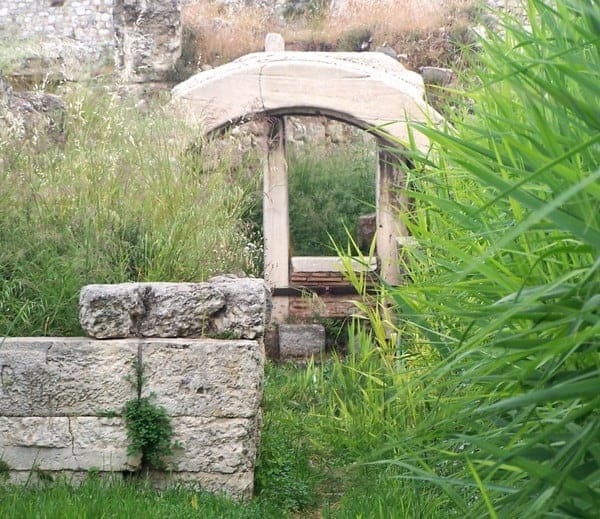 Part of the Sacred Gate, with an arched tunnel (in its Roman incarnation) permitting the river Eridanos to leave the city. Part of the Kerameikos site comprises the very edge of Classical and later Athens within the walls. There are some interesting structures there, including private homes, potters’ workshops (the name Kerameikos primarily referred to the pottery-producing quarter of the city) and a large fountain house, providing fresh water for those leaving or entering the city. The most significant of these buildings is the so-called pompeion, a large building complex just inside the walls. Comprising a series of small rooms, probably andrones, around a central courtyard, this appears to have been used in the preparation for the various religious festivals that structured the Athenian calendar, such as the Dionysia in honour of Dionysos, the god of wine, the Eleusinia, underlining the close link between Athens and the cult of the fertility goddess Demeter at nearby Eleusis, and most importantly the Panathenaia, a major event worshipping the city’s patron goddess, Athena. Those festivals included processions and “floats”, which were probably set up at the pompeion, so the structure had a central, if rather practical, role in the city’s spiritual life. 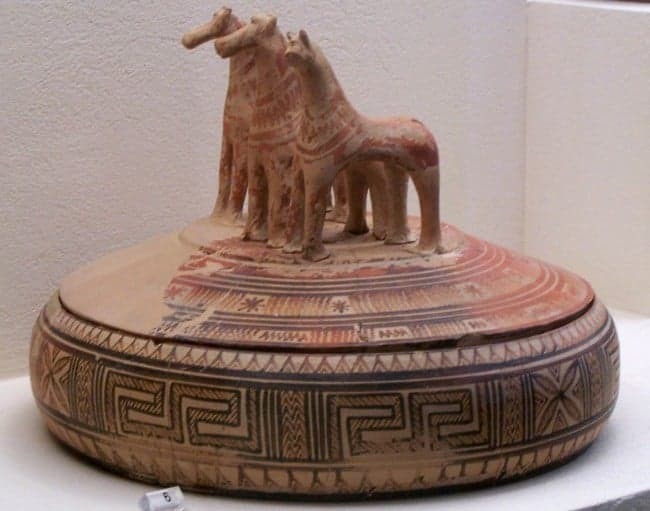 A pyxis (container most likely for jewellery) from the 8th century BC with Geometric decorations and sculpted horses, a symbol of wealth. The most important part of the Kerameikos, however, is the area outside the walls. Here, decades of excavations have revealed part of the enormous necropolis, the cemetery lining the roads immediately beyond the western limit of the city. There were other cemeteries elsewhere outside the city walls, but the Kerameikos was the largest, most famous and most ancient. It also the only one that can be explored as a discrete and coherent site today. The area was used as an important burial ground from the Late Bronze Age, before 1200 BC, until the Roman period in the first centuries AD. During that enormous stretch of time, Athens underwent massive and repeated changes, including the gradual formation of the city state in the 7th and 6th centuries BC, the rise of Athens to the leading power of the Aegean in the 5th, as well as her defeat in the Peloponnesian War and her eventual incorporation into the Roman Empire. The very shape of the city, but also the life that took place within it and the beliefs and ideologies underlying it, evolved and changed again and again, all of which is reflected in the burial habits of the Kerameikos. 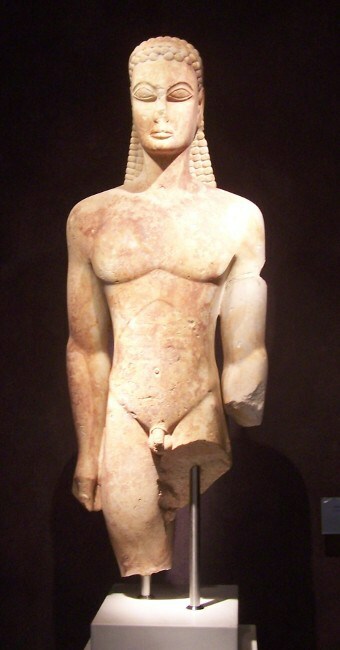 The “Kouros from the Sacred Gate”, a recent discovery dating to about 600 BC. For example, the prevailing form of burial veered back and forth between inhumation and cremation multiple times throughout the first millennium BC. Similarly, the shape of the tombs themselves changed, from simple pits in the earliest periods via great burial mounds for the noble families of the Archaic age to the elaborate grave terraces of the Classical period. At the same time, the type of objects placed alongside the dead or offered at their gravesides underwent a succession of transformations, as did the way individual graves were marked and monumentalised, first with enormous clay vases, later with marble statues, inscribed grave stones and other forms of sculpture. The absence of such monuments during certain periods (most of the 5th century BC and again after 317 BC) is also of interest, as it illustrates the Athenian state’s attempts to rein in excessive spending and social competition. 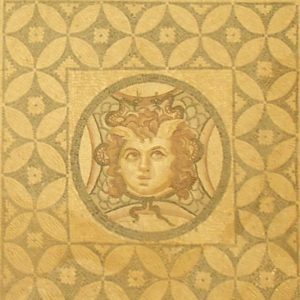 In the Kerameikos, all of this fascinating history can be traced in detail at the small but excellent site museum. 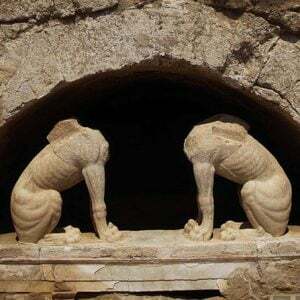 Its collections include key examples of Athenian grave sculpture, among them the wonderful Kouros of the Sacred Gate from the early 6th century BC, and a series of very fine relief-decorated grave reliefs typical for the 4th century, usually depicting the deceased bidding farewell to their loved ones. They are among the finest pieces of ancient Greek stone-carving to have survived. The museum also displays personal objects placed within the graves, as well as a compact but comprehensive gallery of pottery found in or on tombs – an immensely useful and manageable overview of the development of Athenian pottery and vase painting! Classical graves lining the streets just outside ancient Athens, with a backdrop of the modern city. 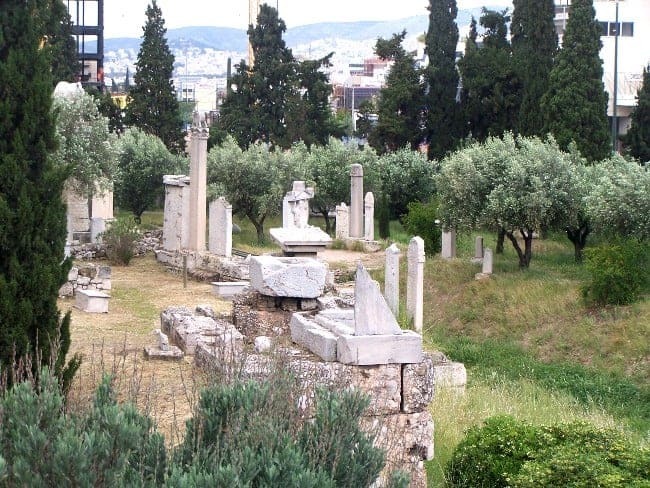 The true highlight of the Kerameikos, however, is the set of grave monuments lining the ancient roads leading outside the city in what is today a park-like setting. An overview of the site is gained from a viewing platform on top of a rounded hill by the entrance. That hill itself is not natural: it is a tumulus, an artificial mound covering two graves from the late 6th century BC. Underneath lay the body of a man, accompanied by pottery from the far side of the Aegean, perhaps a privileged foreigner who lived in Athens under the Peisistratid tyranny. Smaller mounds nearby are probably the burial areas of noble families of the 7th and 6th centuries BC. Beneath runs the Sacred Way, the road that led to Eleusis. 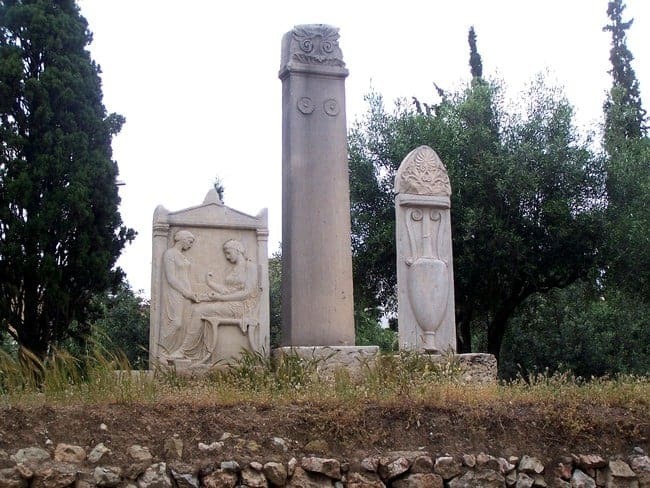 Next to a triangular enclosure sacred to ancestral gods, is a series of gravestones belonging to ambassadors from Kerkyra (Corfu) and from Selymbria (on the Black Sea) who died in Athens, illustrating the city’s wide-ranging contacts. Beyond it, the road forks into two grave-lined streets. Both give a very good impression of what the necropolis would have looked like in the 5th or 4th centuries BC. It is clear that graves were placed and designed for maximum visibility to those entering or leaving the city. Most Classical grave monuments lining these streets were erected upon terrace walls on either side of them; the sarcophagi containing the dead were behind those walls. 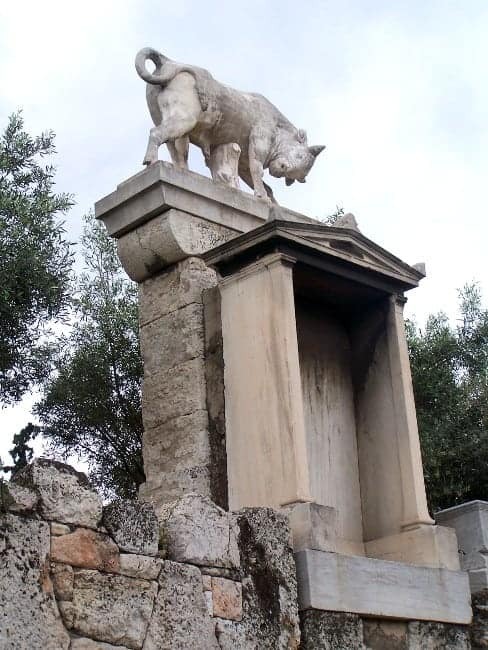 The grave of Dionysios of Kollytos, dual citizen of Athens and Samos, crowned by a mighty bull. There is more to see here than can be discussed in a simple blog post. But the southern side of the road forking left from the Sacred Way is an especially good illustration, as it features a series of especially fine monuments, exemplifying the considerable variation in the type of sculpture used on graves (most originals have been moved into the museum and replaced on site with copies). At the corner stands the warrior relief mentioned above. It commemorates one Dexileos from Thorikos (this area was reserved for families from that town). He died , aged 20, in 394/393 BC, in battle against the Thebans, near Corinth. Like all fallen Athenian soldiers, he was buried alongside his comrades in mass interment – i.e. the grave crowned by his relief did not contain his remains but those of other members of his family. It is followed by a terrace with graves of a family from Herakleia on the Black Sea shore, far away from Athens. A tall central stele bears the names of two brothers, Agathon and Sosikrates. To its left is a relief commemorating Korallion, Agathon’s wife. She is shown bidding farewell to her husband. On the right is a large monument (a naiskos, or grave shrine) for Agathon. Its decoration is lost, since it was not sculpted, but painted. Both corners of the terrace bore marble models of lekythoi, vases used for funeral offerings of olive oil. This very stately Molossian dog has been guarding his master’s tomb faithfully for nearly 2400 years! Then follows one of the most famous monuments in the Kerameikos, the grave of Dionysios of Kollytos, a dual citizen of Attica and Samos, crowned by a marble bull. He died, young and unmarried, around 340 BC. The shrine in front bore inscribed poems about the deceased. The next terrace, an enormous 16 metres long, was that of Lysimachides from Acharnai, who died after 338 BC. The sculptures now placed here probably belong to other monuments, except the large Molossian dog at the near corner, probably originally one of a pair. This single row of graves is just a small excerpt, a glimpse of the very beautiful, highly atmospheric, potentially deeply informative and often profoundly moving experience that a visit to the Kerameikos is. And that experience itself is only one facet of the rich array of unforgettable impressions of, and insights into, past and present that Athens has to offer. You can enjoy the Keramikos on our Exploring Athens tour in spring.